A former director of the Narcotics Control Board, (NACOB) Mr. K B Quantson has asked government to open fresh investigations into how 2,310 kilograms of cocaine went missing on board the shipping vessel M. V. Benjamin. 77 parcels of the drug each weighing 30 kilograms disappeared on the high seas in 2006, in what is thought to be the biggest cocaine scandal in the country. Although a committee chaired by the current Chief Justice Georgina Wood was set up last year to investigate the case and other narcotics related matters, the drugs were never found. 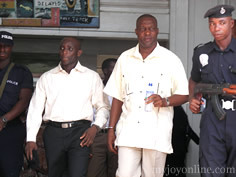 Only last week, the fast track High court sentenced two drug barons Issa Abass and Kwabena Amanin alias Tagor to 15 years in jail with hard labour following recorded conversations that linked both men to the lost cocaine. Mr. Quanson says the Attorney General should also come out to explain why the Police Director of Operations ACP Kofi Boakye is not facing prosecution. Speaking to Joy News’ Matilda Asante on the question of wether the sentencing of the two suspects Alhaji Issa Abass and Kwabena Amanin demonstrates government’s commitment to check drug trafficking, he said this case is one deterrent one, but except it is followed by an aggressive enforcement system the message won’t go down well. He also said assets of the convicted barons should be confiscated and followed by a continuous sensitization of the whole country. Mr. Quantson is also advocating for a national programme through the schools, churches and mosques to sensitise the people because the drugs menace is a problem of the people. On the missing 77 parcels, Mr. Quantson said every effort must be made to find the drugs.